It’s October which means Fall and Halloween are in full swing. 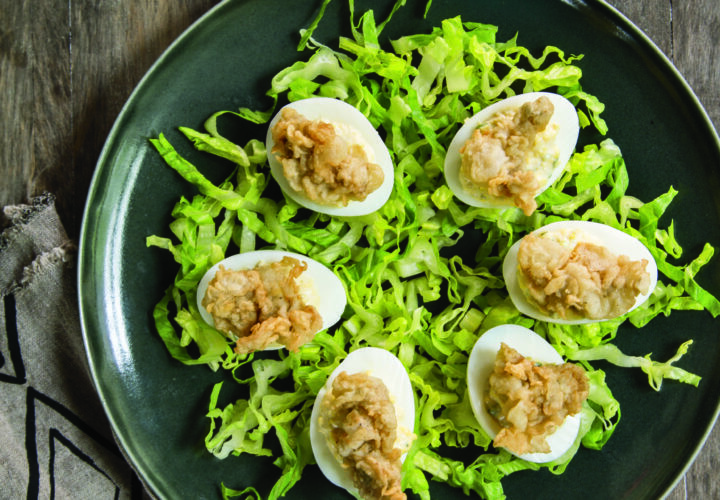 Below is one of my favorite recipes to make, Deviled eggs. I love em because they are incredibly versatile; you can make just about any spin on them, as eggs take well to various flavors. When we make ours at Ditch Plains, we add pickled jalapeños and fried shrimp or oysters. The jalapeño adds a kick to the creamy filling (the deviled part); and the warm, lightly fried seafood goes amazingly well with the chilled egg! Check out the video below, with my director of communications, Emily and let us know what you think. 1. Place the eggs in a large pot and cover with 3 inches of cold water. Set the pot over high heat and bring to a boil. Remove from the heat, cover, and let sit for 10 minutes. While the eggs rest, fill a large bowl with ice and water. Transfer the eggs to the prepared ice bath and let cool completely. 2. Peel the eggs and halve them lengthwise, wiping the knife clean between each cut. Gently separate the yolks from the whites, setting the whites aside and placing the yolks in a bowl. Add the mayonnaise, mustard, and garlic to the bowl with the yolks and mash with a fork to combine. Fold in the jalapeños and celery, and season with salt and pepper to taste. Transfer the filling to a pastry bag fitted with a star tip or to a large plastic bag, and refrigerate until chilled thoroughly. Set the egg white halves on a flat platter, cover, and refrigerate while you make the oysters. 3. In a large, heavy-bottomed pot or Dutch oven, heat the oil over medium heat until it registers 350°F on a deep-frying thermometer. Line a plate with paper towels. In a shallow bowl, season the flour with the 1 teaspoon salt and ¼ teaspoon black pepper and whisk to combine. Dredge the oysters in the seasoned flour, tapping off any excess. Working in batches of 6 to 8 oysters at a time, gently slide the oysters into the hot oil, being careful not to burn yourself. Cook until golden brown, about 1 minute. Using a spider, remove the cooked oysters from the oil and transfer to the prepared plate to drain. Season with more salt and pepper. 4. Pat the egg whites dry with a paper towel and pipe an equal amount of the egg yolk filling into each egg. Top each one with a fried oyster and garnish with a pinch of smoked paprika. Serve immediately, while the oysters are warm. TIP: If you plan on making this dish the day you purchase your oysters, see if your fishmonger will shuck them for you—it will make the whole process go a bit faster, and if you’re not too steady with the oyster knife, it’ll be a lot safer!